Children are the same everywhere you go. Inquisitive, fun loving…waiting for an opening for friendship…hoping for someone to hold their hand…someone to give them a hug. It’s what I found in Brazil, Rwanda and this past week in Haiti. In children we see promise and hope and collectively our hearts ache when we know a little one is hurting. If we also know the future holds few promises for the child before our eyes, how can we walk away and pretend it doesn’t matter? Haiti is a tough place to like. Flying over this island nation, one is less than inspired by the expanse of brown, deforested hillsides. Instead of tourists, the beaches and streets in and around its capital, Port-au-Prince, are covered with garbage. Hope. And yet, in a city where hope seems to have no business showing itself, one can glimpse splashes of hope in the midst of gaudy signs and brightly painted buses filled with expressionless people: children heading to and from school in their uniforms, singing and holding hands. Among these are the children of Haiti Children’s Rescue Mission (HCRM) in whose eyes you can find a hope that only God's love can provide. Pastor Jean Fritz Nicolas and his wife Mireille operate HCRM along with a local Haitian staff. They currently have a little more than 50 children but have had as much as 100 in the past. The children arrive at HCRM in a variety of ways but invariably they are children with few prospects and are vulnerable to starvation, exploitation and abuse. Although some will grow up under the roof of HCRM, opportunities will be sought for each child to be adopted to new families, mostly in North America where they will have greater access to higher education and opportunities in the future. 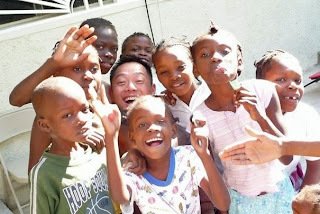 But whether these children remain in Haiti or become part of families abroad, each will be raised in an environment where they will know and experience God's goodness, a goodness that heals and transcends the hurt and bitterness already experienced in many of their young lives. Warmed Hearts. The team lived in the current rental property with the 52 children and had many opportunities to play and build friendships with them. Their cries and laughter became the back-drop of our work and always reminded us of why we had come to Haiti. In an environment where one would expect selfishness and a desire to hoard any small morsel or treat, the children challenged us with their great generosity. Whenever we brought them candies and treats, they would seek out other children to ensure they received their share. We are taught that God's goodness is found in relationship and the children drew us into that goodness every day. One day we were absorbed with troubleshooting the electrical system of our residence. As I stood lost in thought a little hand slipped gently into mine. The little boy simply wanted the contact of having his hand held. Could I possibly be "too busy" for that? New Land. Having operated out of rented facilities for a number of years, the establishment of HCRM as a viable, long-term ministry dictated that it begin to seek property for a more cost effective, permanent home. In 2008 HCRM purchased a raw piece of land in the municipality of Gressier, just beyond Carrefour which is a district outside of Port-au-Prince. The property, located on the top of a hill, is about 12 miles (19 km) from HCRM's present location in the Port-au-Prince suburb of Petionville. The expansive view toward the Caribbean Sea on the new property is stunning and the air is fresh and clean. With its modest but growing financial support base it was crucial that HCRM establish a practical and economical strategy to develop the property, with all their required facilities and infrastructure, to its full potential and so for that, HCRM contacted eMi. eMi. An eMi team of 11 (1 staff, 1 intern and 9 volunteers) arrived in the bustling airport (with as many want-to-be porters as travelers) of Port-au-Prince on February 14, 2009. For the next week the team would conduct a detailed topographic survey of the property, investigate issues of infrastructure (water, sanitation, power) and design all the facilities needed through a series of detailed interviews and discussions with Pastor Jean Fritz and his wife. As this property is not connected to the government electrical grid or municipal sanitation, the technical challenge to our team was to design facilities and infrastructure that would operate with maximum efficiency and cost savings to conserve fresh water (from collected rain and an on-site well) and generated electrical power. The treatment of all waste-water would be done on-site. Potable water would be brought in until an economical on-site treatment system can be installed. New Orphanage. The result was a facility in several buildings that could house and feed 200 children with 20 live-in nannies and provide living space for 22 resident staff and 38 guests/volunteers. There would also be individual homes for the director’s family and one other long-term volunteer family. Also included on the property will be a church, a health clinic and land for small scale agriculture. The health clinic and church will benefit both the orphanage as well as the surrounding community. The children will receive their education at a school in neighbouring Carrefour which is also being established by HCRM. Project Photos. A new set of photos has been placed in my Photo Gallery for this project, so click here (Photo Gallery) and see the HCRM set with a slideshow (click the middle of the photo for commentary). If you want to spend a little more time looking and reading, click here in Details (Photo Details). Check it out and see what your support, encouragement and prayer have produced in the work of this team. “Thank you” to all our prayer and financial supporters for making this project a reality.